Don’t look now, but My Little Pony has invaded the world of cool urban art. Actually, they did a long time ago, but with the phenomenal success of My Little Pony: Friendship is Magic, people’s awareness of ponies as fine art has grown by leaps and bounds. 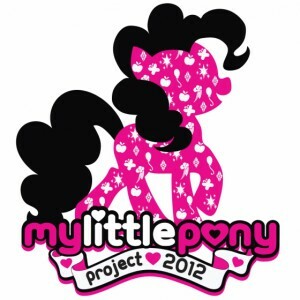 So folks are expecting quite a turn-out for this month’s My Little Pony Project in Los Angeles, California. Headquartered at the Toy Art Gallery (7571 Melrose Avenue), My Little Pony Project 2012 features 2D and 3D high art from a variety of artists, all dedicated to their interpretations of My Little Pony — the current show and previous incarnations. This year, the gallery is hooking up with several local retail stores in the Melrose high fashion district (including Munky King, Japan L.A., and Joyrich) to display pony art and pony materials. Two of the sponsors of the month-long event (which started today and ends May 26th) include t-shirt maker We Love Fine and DVD maker Shout Factory. Juxtapoz Magazine has a good write-up on their site explaining it all. I probably will NOT try to see this. I e-mailed the gallery to ask about wheelchair access, whether they have a parking lot, and so on, and the only answer that they would give is, "Our store and gallery is very wheelchair accessible. Stop by any time! Thanks." But when pressed for confirmation whether they have a parking lot or not, or what parking is available near their gallery, all they would do is repeat over and over that they are very wheelchair accessible. This strikes me as deliberately avoiding the question, and makes me wonder if they are really wheelchair-friendly. Let us know what the exhibition is like. I think this is it (the place for let) - it looks like they are just terraced on a street at the ground floor, without a parking lot, but with metered parking out on the street at the front. [...] the only boutique committed to the art of handmade one of a kind rock and roll fashion. The clothing of FSLA is exclusively for those who set the trends, not follow them. This is authentic ROCK garb. We have traveled back to a time when true artists created "wearable art" [...] Blood, sweat, tears and a lot of rock 'n roll go into every piece. Google initially took me up to the 9000 block of Melrose Avenue, which turns out to be the headquarters of Napster. Who'd have thought they'd be in West Hollywood, right under the nose of the movie execs?